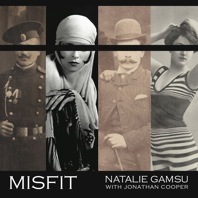 Misfit is an intimate collection of songs specially arranged for singer Natalie Gamsu by Jonathan Cooper who accompanies her on piano. Misfit tells the tales of various sorrowful souls through songs by Annie Lennox, The Divine Comedy, Scott Walker, Bryan Adams and others - a delicious rogue’s gallery. Natalie was recently described by film director Bruce Beresford, reviewing a live performance of Misfit in Sydney, as "the equal, no doubt, of Piaf, or Fréhel, or Dietrich in her 1930s heyday". The CD is posted out from Australia, hence the higher cost.